Magento 2 Extension- 10 Reasons To Upgrade Your Magento Store Now!!! Upgrade to this Magento 2 extension for being the market leader in your particular business segment. An eCommerce champion platform has finally landed. Yes, you heard it right. It is really heartening that all the speculation about this Magento eCommerce platform has finally ended when its latest update Magento 2 extension was released in the Q4 of the last year 2015. All the voices that were earlier talking about this feature packed wonderful eCommerce platform suddenly went into exile. This latest version is known as the Magento 2 Merchant Beta. Let us provide you a brief information about this latest Magento 2 update. Magento 2 extension- This successor of Magento 1.9 is an impressive eCommerce platform in more than one form and has been introduced with the main intent or purpose of providing added security, functionality and appearance to numerous Magento site owners. One of the biggest achievement of this eCommerce platform is that it is built on the HTML5/CSS3 setup which makes it a much cleaner upgrade and makes it suitable for various digital devices like desktops, laptops, mobiles or tablets. This open source platform has been the most talked about thing for numerous web development services around the world. Magento 2 Extension has emerged as the major overhaul in the recent years and has been tipped to change the future of the eCommerce business to a great extent. It has grabbed the fancy and imagination of everybody within a short span of time since its release in the last quarter of 2015. Take a look at the various amazing features of this Magento update that has been acting as a treasure trove for numerous online store owners of the world. The new Magento 2 extension has a simplified and organized structure for making quick customization. - The structure has become a little simplified and synchronized as everything is now placed under the app structure. - Every module consists of its own VIEW directory where you can access all template, layout, js and css/less files of any specific module of your update. Due to this improved structure, it is now bit easier for module developers as they can now make quick changes or customizations without the need for any modification in the core site functionality. With LESS and CSS files of Magento 2, page loading, SEO friendliness and website performance has improved a lot. One of the specialty of this new Magento 2 extension is that it uses its own LESS and CSS files in the core theme instead of using Bootstrap. This latest update consists of the publisher that can help in finding and publishing the CSS files together with the aid of other static files that are placed under the pub/ directory. Moreover, the publisher also extend its support for preprocessing of the files that are published by the help of other preprocessors. Let us explain you the benefits of using the LESS files. - It helps user to customize a theme in a easier and faster manner. - This LESS files plays a significant role in improving the performance, page loading time and SEO friendliness of the system due to the presence of LESS preprocessors and CSS URL resolver. Magento 2 UI library has redefined the Magento store in terms of design, customization and functionality. - It is built on LESS preprocessor. - It can be easily customized as per the business requirements of your Magento store. - The Magento UI library can be easily maintained and is responsive in nature. - It is highly accessible and is based on web standards. Various modules like customer, catalog, checkout, sales, CMS and others are present as components that can be disabled and replaced with the other types of functionalities. However, with the emergence of this Magento 2 extension, there is no need to make any changes in the existing code for making required customization in the modules of this update. Thus, in this way, the performance and flexibility of the site is retained in an effective manner. Magento 2 extension has more advanced technologies integrated into it that has made it more functional and effective than the previous version. With this latest update, various new functionalities and technologies are added that were earlier missing in the previous version of the Magento platform. It consists of the latest versions of the PHP, CSS3, JQuery and other such technologies. To provide you a better insight about the functionalities of both the versions, let us take a look at this infographics below. Improved indexers, performance toolkit and varnish technology in Magento 2 has provided the boost to website performance. - Presence of improved indexers- Due to the availability of the default indexers in the Magento 2 platform with efficient updates, performance has been improved significantly for the speedy performance of query. - Effective Magento performance toolkit- For improving the system performance, it is now easier to create test environments, test various code changes and other such tasks through the new set of performance test scripts of this latest Magento update. - Consists of varnish technology- In order to reduce the server load and to improve the page loading speed, Magento 2 extension is integrated with Varnish cache, which is one of the leading HTTP technology that can play a crucial role in faster caching of the common requests. Full page caching, docker and other features has improved the scalability to a great extent in this Magento 2 platform. Apart from this, tremendous improvements has been made in the field of scalability. Here are the various steps that has been taken in this direction. - Caching of the full page- This new Magento update has made the caching of the static page much faster and has thus reduced the significant load on the server. - Facility of multiple admin users- It is now much easier and faster to create and edit the products without any fear of data conflicts with the help of this latest update. This Magento 2 platform can be easily upgraded due to introduction of new upgradation features and policies. This new Magento extension has made the crucial upgradation task a bit easier and has reduced the involved revamping cost to a great extent than what it used to be in the case of the earlier versions of this Magento platform. Let us discuss the various improvements that has been introduced in this newer update of the Magento platform as described below. Seamless upgradation to the new version- With this new update, the upgradation has become much simplified due to the presence of new updated information about versioning policies and upgradation compatibility. Faster installation of the Magento platform- The presence of the Magento standalone installer has made the installation of new Magento update much easier and faster as the installer itself checks all the pre- requisites before starting the installation process. This installer itself works as an independent script from any other application/platform. Due to this, system integrators can easily script Magento installations and can effortlessly upgrade to standard deployments. Installations/upgradations of extensions- For reducing the problems that are caused by the installation/upgradation of the extensions, Magento 2 update provide functionality to extension developers for providing detailed information regarding version compatibility on native codes, dependencies on other available components, system requirements and other such factors. Quick upgradation to Magento 2 platform- The previous version of Magento platform can now be effortlessly upgraded to this new Magento 2 extension due to the presence of effective export/import functionality that helps in exporting the customer records, product catalog, inventory data, customer data and other standard records which can now be readily imported to this new Magento update without any problem. However, one of the drawbacks related to this upgradation is that any customization that has been created on the previous version of the Magento platform can’t be transferred to this new update and they need to be recreated again. 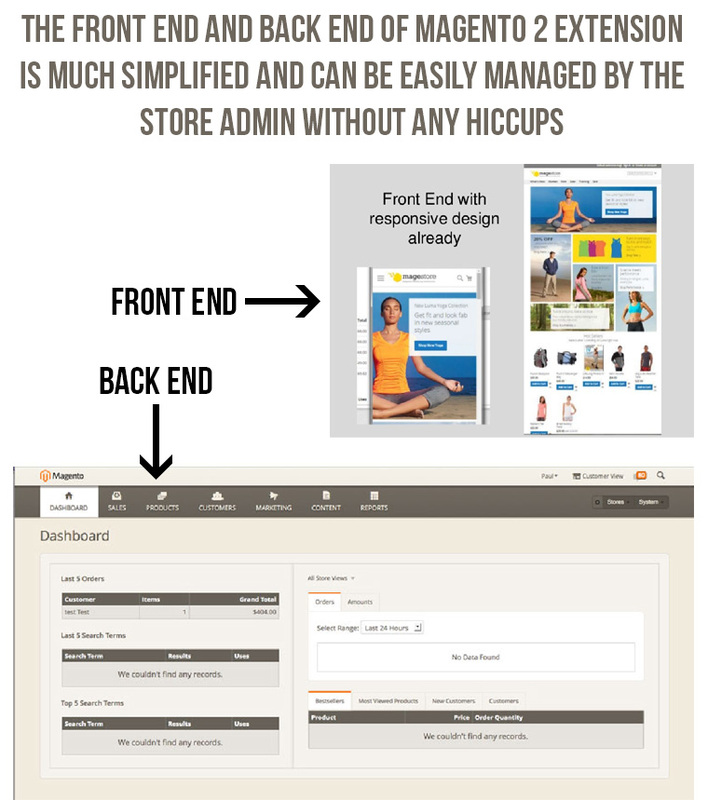 The front end and back end of Magento 2 extension is much simplified and can be easily managed by the store admin without any hiccups. This new Magento update has an effective user friendly back end interface that allow users to check the various analytical information with great ease. Apart from this, the front end of this Magento update is much improved due to the presence of reduced CSS preprocessor and inclusion of modern HTML5 themes. This has made the look, feel and functionality of the website much easier for the developers without changing its overall functionality. The drag and drop feature of Visual Design Editor of Magento 2 extension has made customization much easier. This new improved Magento update is packed with the Visual Design Editor that is easy to use due to the “drag and drop” and makes editing of the Magento layout a bit easier task. With this Visual Design Editor, making required changes in the containers and blocks does not require any special technical knowledge. Thus, it facilitates effective changes in the admin panel without any difficulty. With the bundle of features and enhanced functionality, it can be easily apprehended why this new Magento 2 extension is the “next big thing on the block”. It comes loaded with multiple functionalities that can provide a complete revamped look to your existing Magento store and can ensure you winning results in terms of customer engagement, site traffic, product sales and user experience.